The Guringai (Kuringai) speakers are thought to be the original inhabitants of northern Sydney and the inner eastern Harbour regions. Guringai-speaking clans of about 40 to 60 people were made up of smaller extended family groups of perhaps a dozen people. Guringai speakers (some of whom called themselves by the clan names below) met the first fleet when it arrived in 1788 and they were the first Indigenous people in Australia to resist Phillip’s fleet. They inhabited the north shore of Sydney Harbour, living along the coast from Kirribilli then north to Manly up along the northern beaches to Broken Bay and as far as Wyong. Inland they extended to the Lane Cove River. The word for man or person is kuri (Koori) and kuringga, the possessive means ‘belonging to kuri’. Ngai (ng/guy) means ‘woman’. Within the language area were many tribal names such as Garigal, Gayamaygal, Gai-mariagal and Borogegal. The Cameraigal were considered by the first fleet author Collins as “by far the most numerous tribe of any within our knowledge” (Collins 1975, p. 453). Richard Hill of the Aborigines Protection Board wrote that the “Cammera” people extended from the northern part of Sydney Harbour, “say from North Head to Lane Cove River or estuary, right away north to the Hawkesbury, and away east to the sea coast” (Hill and Thornton 1892). 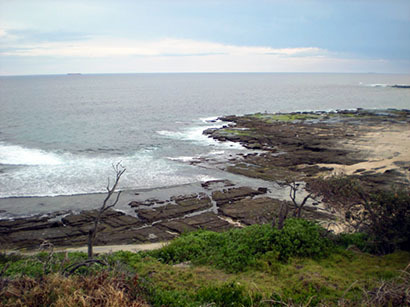 Cammeragal, therefore, seems to have been a collective name for a strong alliance of clans on the north Harbour of Port Jackson. The Garigal (Carigal, Karigal) mentioned by the Reverend Lancelot Threlkeld, inhabited the south shore of the Hawkesbury River (Deeriban). Willemerring who speared Governor Phillip was from this clan. The Cannalgal inhabited the area of Manly Beach and the coast to Dee Why.